While I-5 is reviving, so should you. Does anyone else need to recover from the 4th of July holiday?🙋🏾‍♂️🙋🏽‍♀️🙋🏻‍♂️🙋🏼‍♀️🙋🏽‍♂️While I-5 is reviving, here’s an idea…you should take time to revive you and yours! In case you missed it in our early week edition of What’s Moving Seattle, we announced the next big #ReviveI5 (NB I-5) closure starting this Friday from 8 PM through Monday 5 AM. All NB I-5 lanes from W Seattle Bridge off-ramp to Seneca St will be closed. It happened once already, and Seattle…you were #totallybrilliant! Staycate with some in-town activities. Visit for the day or whole weekend! The Chinatown-International District for the Dragon Fest Saturday and Sunday, in S King St/Hing Hay Park. Open your mind up to options. Accept and embrace the closure!😉 Join the revival, and bring snacks…we did more than just survive June 1-4. Seattle, you were resilient! If you have to travel north or south, use transit, walk, or bike your way around to reduce congestion stre ss! If your bus gets stuck in congestion – be prepared. Have your favorite music, a good book, smartphone game, or a tablet to work on. And if you’re driving, click the alternate routes map to the right, for suggested pathways. Psych yourself up for delays, and zen out…. knowing that this is the last full Revive I-5 closure of the summer….the final project weekend, Aug. 10-12, is a mere partial NB I-5 reduction. Just a piker. Want to know what we know? Read it below! Then on Thursday eve, check back for our Weekender Edition updates. TUES 7.10 → MON 7.16 | Work on post-Alaskan-Way-Viaduct-demolition mobility continues. Columbia St from 1st to 3rd avenues is becoming 2-way for bus routes coming from W Seattle. Traffic signal work is now complete, with final inspection underway. The added left turn lane between 2nd and 3rd will remain until project completion–expected July 16. TUES 7.10 & SAT 7.14 | Following their mid-day July 10 home game against the L.A. Sparks, the Seattle Storm is back at Key Arena Saturday, playing the Dallas Wings, @ 6 PM. FRI 7.13 | Tim McGraw & Faith Hill perform at KeyArena, 7:30PM – 11PM. Estimated attendance is 10,000–meaning a crowded Lower Queen Anne on Friday night! 3 days of seafood in Ballard. FRI 7.13 → SUN 7.15 | Go fishing, Nordic style! The annual Ballard SeafoodFest starts Friday, 5 PM – 11 PM, continuing Saturday 11 AM – 11 PM and Sunday 11 AM – 9 PM. Sat/Sun crowds are estimated to be around 23,000. Try mass transit to avoid parking struggles! FRI 7.13 → SUN 7.15 |The annual West Seattle Summer Fest runs 10 AM – 6 PM Friday/Saturday, and 11 AM – 5 PM Sunday. Expect about 7,500 people opening night; followed by 12,500 July 14, and 5,000 the final day. California Ave SW between SW Edmunds and SW Genesee streets will be closed for the event. Cap creative for the Helpline. SAT 7.14 | An expected 800 people will take part in the Queen Anne Helpline Fun Run, Saturday. Walkers start at 8:30 AM; runners at 9 AM, at Queen Anne Lutheran Church, at 8th Ave W and W McGraw. Prizes for fastest finishers and best hat contest winner! Derby Days at Green Lake. SAT 7.14 | The Annual Seafair Milk Carton Derby Race is this Saturday, on Green Lake off the Aqua Theater. More than 3,000 people are expected for the 9:30 AM – 5 PM event! SAT 7.14 | The 69th Annual Wallingford Family Parade runs from 11 AM to 12:30 PM Saturday, on N. 45th St. between Bagley Ave N and Interlake Ave N. Estimated attendance is 1,500. SAT 7.14 | The next monthly SODO flea market is this Saturday, on Utah Ave S between S Stacy and S Holgate streets. Utah Ave S will be closed 6 AM – 6 PM to include set-up and break-down of the 10 AM – 4 PM event. Estimated attendance is 1,000. SAT 7.14 | The Queen Anne Day Festival is at West Queen Anne Playfield Saturday, 11 AM to 8 PM. Estimated attendance is 500. Run like a Viking; walk like an Egyptian? SAT 7.14 | Whether you walk like an Egyptian or a Viking, you’re welcome to join Saturday’s 5k run/walk event! Don your Norse seafaring attire for the 9 AM trek at the new Nordic Museum! SAT 7.14 → SUN 7.15 | The Nordic Museums’ 35th Annual Viking Days are now the same weekend as the Ballard Alliance SeafoodFest–for all things Nordic! About 250 attendees expected to the Viking encampment at 2655 NW Market St.
STP starts in the wee hours. SAT 7.14 → SUN 7.15 | Up to 10,000 participants are expected in the ~200-mile Seattle to Portland bicycle ride, over one to two days. Riders start at University of Washington’s E-1 lot, heading out in 10-minute waves beginning at 4:45 AM. The last rider will leave at 7:30 AM. Dragon Fest @ Hing Hay Park! SAT 7.14 → SUN 7.15 | Dragon Fest 2018 – This Annual Chinatown/International District community festival is at S King St/Hing Hay Park from 12 PM to 8 PM Saturday, and 12 PM to 6 PM Sunday. Approximately 10,000 attendees are expected each day! SUN 7.15 | The Swedish 5k Summer Run & Walk is this Sunday, on Seattle’s First Hill and Capitol Hill, to benefit Ovarian Cancer research. Estimated attendance is 2,800 at the morning event, 8:15 – 11 AM. Reviving I-5 & paving SR99. MON 7.9 → Fall 2019 | WSDOT crews just started the 1.5-year project to repave 7.58 miles of State Route 99/Aurora Ave N, between Roy St and N 145th St. Dozens of ADA compliant pedestrian ramps will also be rebuilt/added. Much of the work is planned for overnight shifts, opening lanes up at 5 AM on weekdays. Some daytime closures may be necessary, though WSDOT says at least one lane of SR99 will stay open in each direction. FRI 7.13 → MON 7.16 | WSDOT Full NB I-5 closure at W Seattle Bridge off-ramp to Seneca St, starting at 8 PM Friday, running through 5 AM Monday. Expect delays and bring a snack! The final weekend closure will be a partial NB I-5 reduction, scheduled for August 10-12. SAT 7.15 | SB I-5 between NE 45th St and SR 520 will be reduced to two lanes, 2 AM – 12 PM. This Ship Canal Deck work is weather dependent. SAT 7.15 | NE 45th St on-ramp to NB I-5 closed, 2 AM to 12 PM for weather-dependent Ship Canal Deck work. Visit WSDOT King County weekly update page for more information. 1st & Yesler | Full Intersection Closure on July 7-8. Utility work for the Center City Connector. To complete utility work for the Center City Connector, the intersection at 1st Ave S and Yesler Way will be closed on July 7-8 for our crews to install a new water main. Closure | Full intersection closure at 1st Ave S and Yesler Way from 7 AM on Saturday, July 7 to 9 PM on Sunday, July 8. Detours | Detour signs will be posted. EB Yesler Way will be closed at Western Ave, except for local access. WB Yesler Way will be closed at 2nd Ave, except for local access. NB 1st Ave will be closed at S Jackson St.
SB 1st Ave will be closed at Cherry St, except for local access. WB James St will be closed at 2nd Ave, except for local access. Temporary sidewalk and crosswalk detours at the intersection of 1st Ave S and Yesler Way. 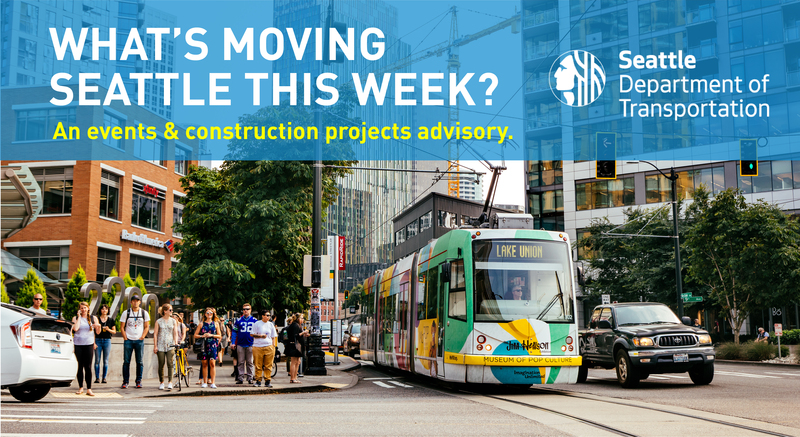 Visit our project website for more information or contact our team by calling 206.400.7578 or emailing centercitystreetcar@seattle.gov. Paving project on 3rd Ave Downtown Seattle. SEATTLE – We’re advising travelers that 3rd Ave will be temporarily reduced to a single lane in each direction between Wall and Battery streets on Tuesday, April 24 for lane striping. During this time, Blanchard St between 2nd and 4th avenues may also be reduced to a single eastbound lane for striping. Pedestrian access will be maintained, though certain crosswalks may be temporarily inaccessible. Posted detour signs will be onsite to assist those walking. For more information on this project, visit the 3rd Avenue Paving Project website. Intermittent Lane Closures on Westlake Ave N, Mon., August 22 through Fri., August 26 from 9 a.m. to 3 p.m.
SDOT will be installing a new traffic signal on Westlake Ave N at 8th Ave N. One lane in each direction will be restricted intermittently on Westlake Ave N near 8th Ave N, Monday, August 22 through Friday, August 26 from 9 a.m. to 3 p.m.
Crews are also building ADA ramps at the Galer St crossing on the east side of Westlake Ave N. One northbound lane will be restricted intermittently on Westlake Ave N near Galer St, Monday, August 22 through Friday, August 26 from 9 a.m. to 3 p.m. This work is part of SDOT’s Westlake Cycle Track project to create a safer and more predictable corridor for people walking, biking, and driving. SDOT thanks the public for its patience while this work is being completed. Please visit http://www.seattle.gov/transportation/wct.htm for more information. Intermittent Lane Closures on Westlake Ave N, Monday, August 15 through Friday, August 19 from 9 a.m. to 3 p.m.
SDOT will be installing a new traffic signal on Westlake Ave N at 8th Ave N. One lane in each direction will be restricted intermittently on Westlake Ave N near 8th Ave N, Monday, August 15 through Friday, August 19 from 9 a.m. to 3 p.m.
Crews are also building ADA ramps at the Galer St crossing on the east side of Westlake Ave N. One northbound lane will be restricted intermittently on Westlake Ave N near Galer St, Monday, August 15 through Friday, August 19 from 9 a.m. to 3 p.m. This work is part of SDOT’s Westlake Cycle Track project to create a safer and more predictable corridor for people walking, biking, and driving. SDOT thanks the public for its patience while this work is being completed. Please visit http://www.seattle.gov/transportation/wct.htm for more information. 15 – 17 while crews complete work on the 23rd Avenue Corridor Improvements Project. Local access will be provided to residences and businesses. This schedule is weather dependent and subject to change. Please see below for details. The intersection of East Cherry Street and 23rd Avenue will be closed to traffic in all directions, but local access to destinations near the intersection will be provided. o East Cherry Street will be open only for local access from 21st Avenue to Martin Luther King Jr Way. o 23rd Avenue will be open only for local access between East Union Street and East Yesler Way; however, regular southbound access will resume at East Jefferson Street. o Northbound 23rd Avenue remains closed between East Cherry and East Union streets. o For southbound 23rd Avenue traffic, drivers will follow a detour via East Union Street to 14th Avenue, with a left on East Jefferson Street to return to 23rd Avenue. o For northbound 23rd Avenue traffic, drivers will follow a detour via East Yesler Way to Martin Luther King Jr Way, with a left on East Union Street to return to 23rd Avenue. o For westbound East Cherry Street traffic, drivers will take Martin Luther King Jr Way to East Union Street. To return to East Cherry Street, use 14th Avenue. o For eastbound East Cherry Street traffic, drivers will take 21st Avenue to East Jefferson Street, following 23rd Avenue south to East Yesler Way. For information about bus service, look for Rider Alert notices at bus stops, visit Metro Online at www.kingcounty.gov/metro, or call 206-553-3000. Friday night service for routes 3 and 4 will be serviced by a shuttle around the intersection closure; call Metro for more information. Pedestrian crossings will be maintained and clearly marked. SDOT would like to thank the public for its patience while this work is completed. Please visit the website for more information: http://www.seattle.gov/transportation/23rd_Ave.htm. SDOT is scheduled to begin construction the week of April 4th of a new curb ramp that will meet Americans with Disabilities Act (ADA) standards on the southwest corner of 7th Avenue and Spring Street. Construction is weather permitting and expected to take up to two weeks to complete. Construction activity and traffic impacts from 7:00 a.m. – 3:00 p.m., Monday through Friday. Closure of the southbound lane of 7th Avenue between Spring Street and Madison Street. A detour will be in place using Spring Street, 8th Avenue and Madison Street. Eastbound traffic on Spring Street will be limited to one lane between 6th Avenue and 7th Avenue. Sidewalk closure on the south side of Spring Street between 6th Avenue and 7th Avenue. Please use the sidewalk on the north side of Spring Street and follow pedestrian detour signage to safely access your destination. Noise, dust and vibration associated with construction. This work is part of a citywide effort to upgrade curb ramps at many locations to make our sidewalks accessible to everyone. SDOT would like to thank the public for its patience while this work is completed. For more information about SDOT’s curb ramps and accessibility guidelines, visit www.seattle.gov/transportation/CurbRamps.htm. SDOT will resume work on Renton Ave S between S Trenton St and 51st Ave S and at the intersection with S Kenyon St as early as Monday, March 21, as part of the Renton Ave S Repaving Project. In order to complete this work, for approximately three weeks, parking will not be allowed on Renton Ave S between S Trenton St and 51st Ave S as SDOT repaves the road. Northbound vehicles and bicycles will be detoured around the work area to Rainier Ave S by way of 51st Ave S from 7 a.m. to 7 p.m. daily during this time. Southbound traffic will remain on Renton Ave S, and protected turn pockets will be removed. Flaggers at cross streets will direct traffic and help pedestrians cross Renton Ave S. The road will open at 7 p.m. each night. Traffic delays are expected on Renton Ave S at the intersection with S Kenyon St as SDOT installs traffic signal vehicle detection in the road. This work will begin as early as March 21 and will take place between 7 a.m. and 5 p.m. daily for approximately two weeks. Flaggers will direct and maintain two-way traffic. During construction all sidewalks and Americans with Disabilities Act (ADA)-compliant ramps will remain open to the public. SDOT would like to thank the public for its patience while this work is completed. The Renton Ave S Repaving Project will improve safety for all users of Renton Ave S, a minor arterial street serving approximately 8,800 southeast Seattle commuters, transit users and commercial vehicles daily. The project has installed 65 new curb ramps in 13 locations and nine new curb bulbs between S Holden St and 51st Ave S during the fall of 2015. SDOT also repaved the road from S Holden St to S Trenton St during the fall of 2015. Repaving from S Holden St to S Roxbury St was postponed until this spring because of weather. For more information, please see the Renton Ave S Repaving project web page.